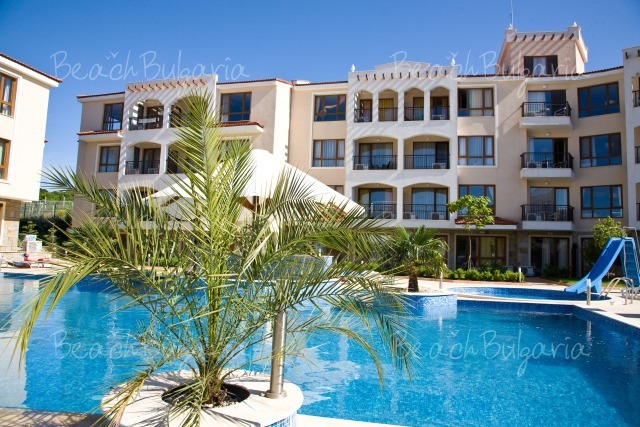 Bay Apartments Hotel is situated just 100 m away from the beach in the Budjaka site, near Sozopol. 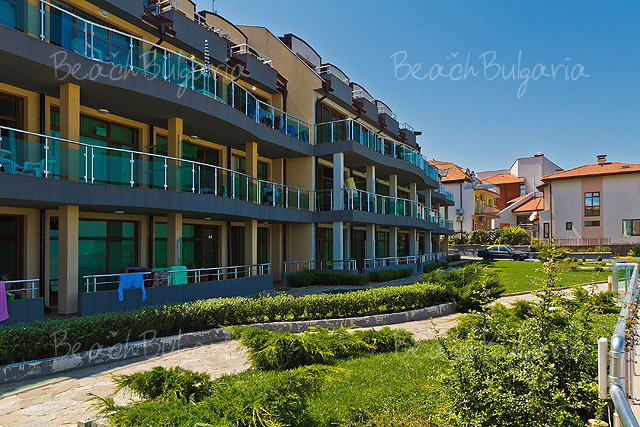 The hotel is just 2 km away from the central part of Sozopol and 1.5 km from the largest beach in the area - Harmani. Bay Apartments Hotel features 20 studios, 1-bedroom suites and 2-bedroom suites. The air-conditioned suites feature a seating area with cable TV and a fully equipped kitchenette with a dining area. There is a private bathroom with a shower. Free Wi-Fi is available in all guestrooms. The studios can accommodate 2 persons on a double bed and 1 child up to 3 years old in a crib. 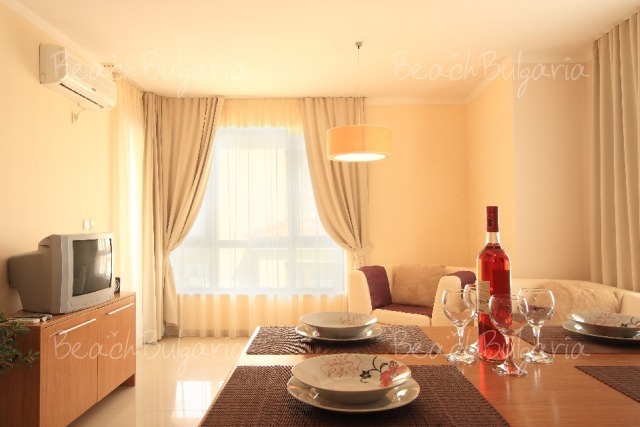 The studios feature a bathroom with a shower, a fully equipped kitchenette, TV, iron/ ironing board, balcony with sea view. 1-bedroom apartments feature a living-room, a kitchenette, a bathroom with a shower, a bedroom, TV, iron/ ironing board, a balcony. 2 adults in the bedroom and 1 – 2 children up to 12 years old on a coach in the living-room can be accommodated. 2-bedroom apartments consist of a living-room, 2 bedrooms, a fully equipped kitchenette, 2 bathrooms with a shower, a balcony. The 2-bedroom apartments offer accommodation for 4 adults in the bedrooms and 1 – 2 children up to 12 years old on a coach in the living-room. The hotel offers daily maid service. Linen and towels are changed twice a week. Some of the rooms feature a microwave and a washing machine. 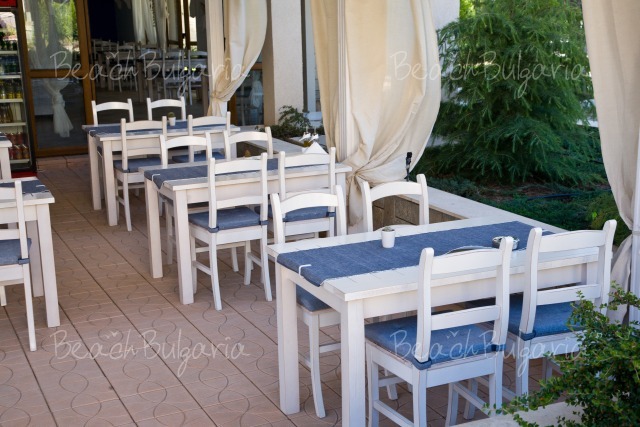 The hotel offers a cosy restaurant with panoramic terrace. Guests of the hotel can relax by the outdoor swimming pool with children section and a slide, sunbeds and parasols near the pool. The complex offers a beautiful garden and bicycle rentals. * The rates are in Еuro per room per night, no meal included. Guests of the hotel can use swimming pool and parking for free. * Cancellations can be made free of charge providing details of this are received at least 7 days prior to check-in time on the day of arrival and 14 days during 05 July - 21 August 2017 - cancellations made after this period will incur a fee equivalent to the cost of two night's accommodation. Please, post a comment on Bay Apartments Hotel.